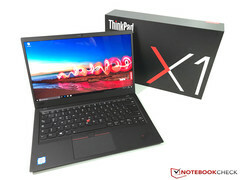 The ThinkPad X1 Carbon is one of the best business Ultrabooks you can buy. Lenovo offers a total of four different displays for its flagship device, and we tested them all. It is often not easy to make the right decision if manufacturers offer multiple components. They often limit their advertising to the high-end SKUs, especially in terms of the display. However, this is not always the best choice for your daily office tasks. This is also the case for Lenovo's current flagship device, the 6th generation of the 14-inch ThinkPad X1 Carbon. Notebookcheck had the chance to test all four different models and we can now give our recommendation. The base display of the ThinkPad X1 Carbon is a matte 1080p screen based on the IPS technology, which is also available as a touchscreen (+ $85.00). The next option is the matte WQHD screen (2560x1440 pixels, + $138.00), which we already know from the 2017 X1 Carbon. The glossy WQHD panel (+ $180.00) is new for this generation, and it is particularly bright with wider color gamut. Lenovo does not use PWM for the brightness regulation on any of the panels, so there is no annoying screen flickering. The two 1080p screens are provided by AU Optronics and there are no major differences in terms of specs except for the additional touch layer. The brightness is at around 300 nits, and you can still use it outdoors thanks to the matte panel surface. The low black value is another advantage, and it results in an excellent contrast ratio in combination with the decent luminance. The picture appears a bit grainy on especially on bright surfaces, which is not uncommon for matte panels. The color accuracy ex-works is completely sufficient for common office tasks, and a calibration is not mandatory. Thanks to their lower resolution, the FHD panels also consume less power, which helps the battery runtime. The optional WQHD panel with the matte surface features a resolution of 2560x1440 pixels. The screen from LG Philips sets you back $138.00 and the subjective picture quality is superior to the 1080p models. Bright areas are very clear (not grainy) and contents appear a bit sharper thanks to the higher resolution. It is also a bit brighter, but the black value is higher as well, which results in a lower contrast ratio. Our test model was not calibrated very well out of the box and we noticed a slight green color cast, but the results after our calibration are excellent. It is even possible to edit some pictures/videos thanks to the nearly full sRGB coverage. The optional WQHD panel with the glossy surface and HDR support is the most expensive option ($180.00) and the best screen based on the specs. The panel from AU Optronics manages an excellent average luminance of 530 nits in combination with high contrast ratio and excellent color accuracy after the calibration. It also covers most of the wider AdobeRGB gamut, so it is really worth the additional price and not too expensive. However, the display has to drawbacks, which can be important depending on your usage scenario. The response times are very slow, and you will see some ghosting. You get used to this, even though the subjective perception can differ. The biggest issue is the very glossy screen surface. It does create a very rich picture, but is very hard to use outdoors. Even reflections from light sources indoors can be an issue. Lenovo's ThinkPad X1 Carbon is primarily an office device, which is also a good choice for field workers or sales representatives thanks to its compact chassis and low weight. With this in mind, we would always recommend a matte screen. We prefer the subjective picture impression of the higher-resolution WQHD panel (sharper image, not grainy), so we recommend this model. However, it should be calibrated if possible. The optional WQHD HDR screen might also be interesting for some users, at least if you can live with the drawbacks. The wide color gamut is certainly an advantage and you will enjoy the display if you do not only use your laptop for work, but also afterwards for some video/movie playback.